Muon-based nuclear fusion is conducted using negative muons. A mixed gas of deuterium and tritium is cooled to temperatures below around −250°C, causing the gas to form a liquid or solid. The injection of a beam of muons (µ) into the medium then generates muonic tritium atoms (tµ), which are similar to hydrogen atoms. As muons are 207 times heavier than electrons, the muon orbits the nucleus at a distance much shorter than that for electrons. Thus, tµ atoms are extremely small, and because the tµ atoms have no charge, they collide with deuterium atoms without being affected by repulsive electrical force. 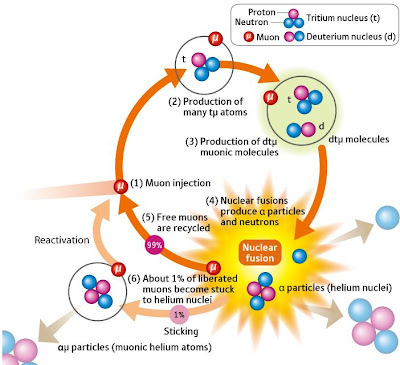 This process produces muonic deuterium–tritium molecules (dtµ), which are also similar to hydrogen atoms, and which have a nucleus consisting of a muon, a deuterium nucleus and a tritium nucleus. Similar to the tµ atom, the dtµ molecule is extremely small, which allows the deuterium and tritium nuclei to come into very close proximity, thus inducing d–t nuclear fusion. More links and information at NextBigFuture.